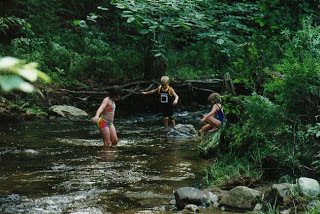 When I was a child I lived in a neighborhood with a brook! Every house that backed up on that brook had a little bridge that crossed over the brook and into the woods. We spent our summers launching stick boats and racing from bridge to bridge to watch them magically appear from under the overhangs. On really hot days, we just sat down in the cool, clean water and buried our toes in the sandy bottom. Memories of a childhood that seamlessly interwove the natural environment into everyday lives are sadly, not that common today. Our children growing up in suburbia tend to spend their leisure or play time inside of houses, cars and malls, attached by their fingertips to electronic devices. The feel of plastic keys for them is normal. They drown out the sound of rustling leaves in the wind and birds singing with the ear buds attached to ipods. If they play sports, more and more of them are playing on artificial turf surfaces - toxic rubber pellets packed into green dyed and lead filled plastic grass carpets. So what is this doing to our children? Some call the phenomenon "Nature Deficit Disorder". I say it is robbing our children of their birthright…of the essence of being alive on this planet. • Mammograms do not protect against breast cancer, and actually deliver ionizing radiation directly to breast tissue. • Anyone can print a pink ribbon on a product label and say they're donating to the fight against breast cancer. • Many of the corporate sponsors of the Pink Ribbon Campaign manufacture products with ingredients linked to breast cancer. Many women will tell you that breast cancer runs in their family. But researchers estimate that less than 10% of breast cancer cases are related to genetics. The truth is that breast cancer may run in families because families share their environment - the air they breathe, the water they drink, the food they eat and the products they use. For years, women have walked for the cure, urged their mothers and sisters and friends to get their mammograms, and purchased pink ribbon products that claim that a percentage of their sales will be donated to breast cancer research. But with all that walking, urging and purchasing, the incidence of breast cancer has increased. The American Cancer Society predicts that more than 230,000 new cases will be diagnosed this year. More than 40,000 will die. A woman's chance of developing breast cancer in 1940 was 1 in 22. Today it's 1 in 7. The fact is, women are getting the wrong message about breast cancer. The message they need to hear it that we can take steps to reduce our risk of breast and other cancers, that we have choices for different (less risky) screening techniques, that we need to protect our young pre-teen daughters when they are most vulnerable, and that our voices together can make a difference in this fight.